Another CTST is in the books, this time without the emphasis on CardTech/SecurTech, the name for previous shows. It was also the first time SourceMedia and the Smart Card Alliance jointly produced the show and, according to executives from both organizations, the new format was a success. “Fantastic,” is the way Randy Vanderhoof, Smart Card Alliance executive director, put it when asked his reaction to the show. “I personally am very pleased with how the event worked out. The conference program turned out to be a big hit with the audience. We generally got great reviews from attendees about the merger of the CTST conference and the Smart Card Alliance annual event.” That SCA annual event is normally held in the fall. This year, the alliance will move its government-focused conference, which is usually held in the spring, to the fall. 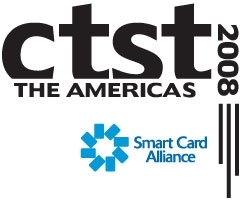 Officially, the conference was listed as CTST The Americas 2008, to incorporate both North America and Latin America, where the Smart Card Alliance also has an organization. The CTST division of labor for the 2008 show in Orlando, Fla. was simple: the alliance would handle all education content and SourceMedia would take care of the production aspects of the show and get the exhibitors there. While attendance was at about 1,500, slightly less than previous years that was by design, according to Dan Rubinetti, vice president of conferences and events at SourceMedia. Obviously no one wants fewer attendees but Rubinetti thinks that will change as word gets out about CTST’s change in direction. Exhibitors were also slightly down, about 100 this year compared to 115 last. “A lot of card manufacturers that bring those big machines decided this wasn’t the show for them. But the card manufacturers who did come did very well,” adds Rubinetti. Rubinetti says he has received “no negative feedback.” SourceMedia is in the process of surveying attendees to get more feedback and suggestions for next year’s conference, which will be May 4-9 in New Orleans. “The way we set up the tracks and the topics we covered and quality of speakers was better than ever. Content to me is very important. It’s the ‘if you build it they will come’ model,” Rubinetti adds. Vanderhoof says that compared with past attendance at Smart Card Alliance annual event attendance was up 20%. He agrees with Rubinetti in the goal behind the conference. “We really wanted to emphasize the conference program,” says Vanderhoof. He says the alliance hasn’t received any specific feedback from its members yet and the organization is going to survey its members. Vanderhoof also wants look at the attendance and figure who attended as well as talk to exhibitors and find out their experience. Feedback from the educational sessions has been affirmative. “People were positive about having a bigger stage to produce the education portion,” Vanderhoof says. “We had more room for people to have meetings, to get together with their customers.” He says the broader education tracks were designed to attract a more diverse crowd. Best session? He points to the mobile and NFC section which generated a lot of buzz. “It was only natural since that’s a topic that fewer people understand, or the direction it’s heading in. People are more interested in knowing what’s to come,” adds Vanderhoof. A priority for the alliance with CTST was to open it up more to the payments and mobile markets. “CTST was more security-focused but now we’re trying to bring everyone together to see this convergence,” says Vanderhoof. The conference was laid out in four major tracks covering identification and policy, payments and applications, mobile and NFC and security and access control. Two “mini-tracks” highlighted emerging technologies and Latin American innovations. One thing Vanderhoof would do differently is the Outstanding Smart Card Achievement awards. This year they were done during the Smart Card Alliance’s opening CTST reception. What has he taken away from that single experience? Talk less, start earlier, and end quicker to enable people to get back to their conversations, he says, laughing.